The landing page plugins for WordPress became an essential part of blogging atleast for me. I won't hit publish button until the page is designed with WordPress landing page plugins. I use such landing page builder plugins to place CTA buttons, adjust columns, email opt-ins, place pricing tables and much more. While I started blogging back in 2013, there are a lesser number of such landing page builder plugins but now the number was increased. There are lot more options available and it's not so easy to choose the best landing page builder for WordPress sites. This post helps you to choose the best among all and I gathered enough data and listed all the top WordPress builder plugins and explained its own pros and cons. Here are the 12 Best WordPress Landing Page Builders of 2019. Hands down, the best WordPress landing page plugins available on the market. When I say they are the best, I have some valid reasons to prove it. While most plugins are recent to market, Thrive Architect was developed since 2013 and gone through various updates, innovative features and the team keeps on bringing new features at an affordable pricing to masses. Thrive Architect was earlier known as Thrive Content Builder and in the year 2017, they got a big upgrade and thus re-branded as Thrive Architect. This is how both the version looks like. Thrive Architect is a drag and drop WordPress landing page builder which can turn your normal looking blogs posts into an income generating landing page and you can design & deploy such sites in no time. 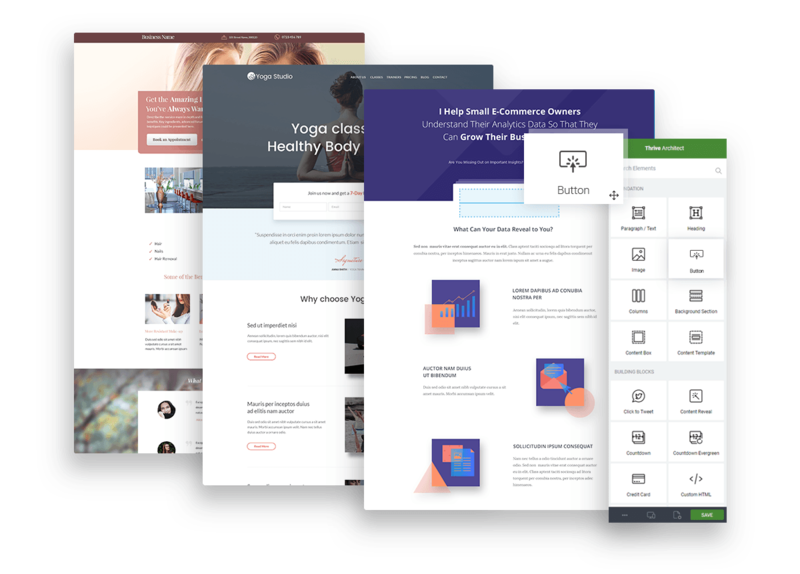 You can use Thrive Architect for blog posts or else you can choose 200+ pre-designed landing pages available inside the plugin to create email optins, course page, personal branding page, webinar page and much more. Apart from regular landing pages, this plugin also helps you to design best blog landing pages for better conversions. You can also Check our exclusive Thrive Architect Review and design stunning web pages in hours instead of months. 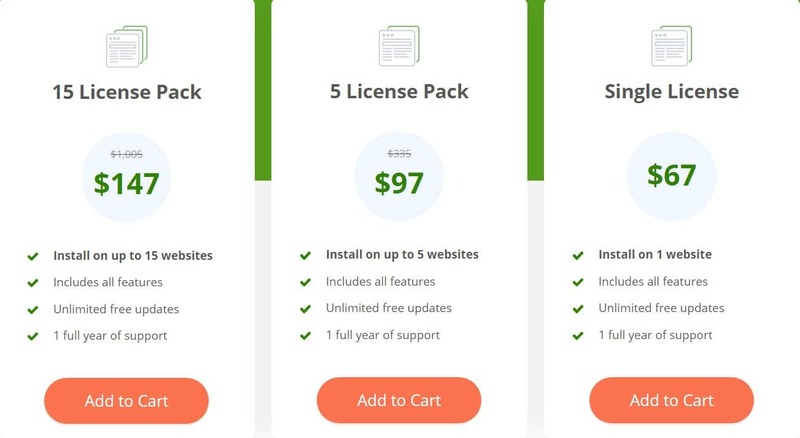 Thrive Architect landing pages costs as low as $67 for a single site license and you'll get support and future updates. Apart from Thrive Architect, Thrive Themes, the company behind this plugin also develops several plugins and I use most of them for my blogs. Divi Builder was launched in 2015 and ever since its launch, Divi Builder upgraded several times and the latest Divi Builder 3.0 brings you a lot of features like instant changes, new visual drag and drop interface, 40+ blocks and much more to say. The best thing about Divi Builder is, it comes with a lifetime subscription. Pay once and enjoy lifetime updates to Divi Builder plugin and you'll also get access to all other Elegant Themes and Plugins. Check Divi Discount Code to avail discounts on Divi Builder. 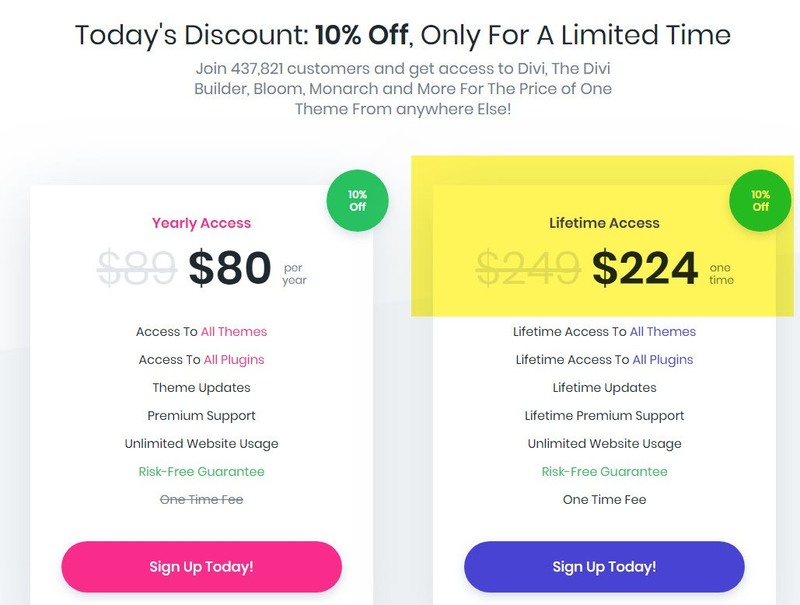 Divi Builder (Review) is another strong WordPress landing page builder plugin which comes with a lifetime subscription. There is also a 30 days money back guarantee powered by live customer support. Instapage is the best premium choice for you to design top landing pages for WordPress in 2019. The tool focuses on creating landing pages that can be handled in just a matter of minutes. Get InstaPage Coupon and save over 24% on annual plans. Instapage has some really cool collections of prebuilt templates and below is my recordings of all templates. Extensive variety of templates for you to use at no added cost. Collaboration support available with other team members, you can share your live screen with them. Easy to migrate any landing pages that you have already created with Instapage platform. Analytical features offer support for identifying keywords, including ones that may be used with Google AdWords functions in mind. Individual blocks on your site can be quickly copied and moved around on your entire site as you see fit. Price starts from $99 per month billed annually and more on review. Make your landing pages look more appealing with the right features of Themify Builder. The Builder plugin from Themify, the premium WordPress themes company provides you with many options for getting your landing page looks right. With Themify, you can use a backend or frontend editor. You can drag and drop data and preview your landing page before going live with it. You can undo or redo anything on your site as you see fit and you have a demand to change things on the fly. You can also duplicate prototypes or import and export modules from other pages if you are confident with what you are using. Offers simple builder column support for organizing your content. Allows you to reuse as many parts of your layout. Works with many animation effects including zoom in, rubber band, swing, flip and pulse effects. Custom styling features let you modify your site in any way you might see fit. Add slideshows, typewriter effects or image filters. Price: $39 for a single layout or $59 for working with all addon bundles and there is also an $399 package where you'll get access to all Themify Themes and Builder plugins. WPBakery, previously known as the visual composer has been downloaded by more than two million people around the world. It works as a front-end editor that helps you to create responsive pages with ease. You can enter in particular elements to use and then highlight them in many colors. You can use pre-built templates with WPBakery, but you also have the option to create your own. You can use many CSS animations, rows, CTA buttons and more than 20+ global elements with these templates to make your landing page stand out of crowd. Online demo site helps you to test out different parts of WPBakery. Front end and back end editors alike are available. Works with integration for many added online sites including social media pages. Produce image galleries with carousel layouts or just work with one specific image at a time on your page. Create simple text blocks as desired. Support for WooCommerce, Ninja Forms, Gravity Forms and Layer Slider. Price: $45 for a single site or $245 for use on a SaaS application. Lead Pages helps you create campaigns that bring in more people. This integrates well with most other digital marketing software and is not complicated to work with. A/B testing is included in Lead Pages. You can create multiple versions of your page to compare each other to figure out what might work right for your needs. Simple analytics program gives you a clearer idea of how well people are using your landing page and accessing it. HTML editing option works alongside the standard interface for advanced use. Create sub-accounts for others in your business to access when editing your page. Lead notifications help you to identify when new leads are coming onto your site. Allows you to duplicate your setups onto as many domains that you own as desired, thus making it easier for data to be adjusted properly. 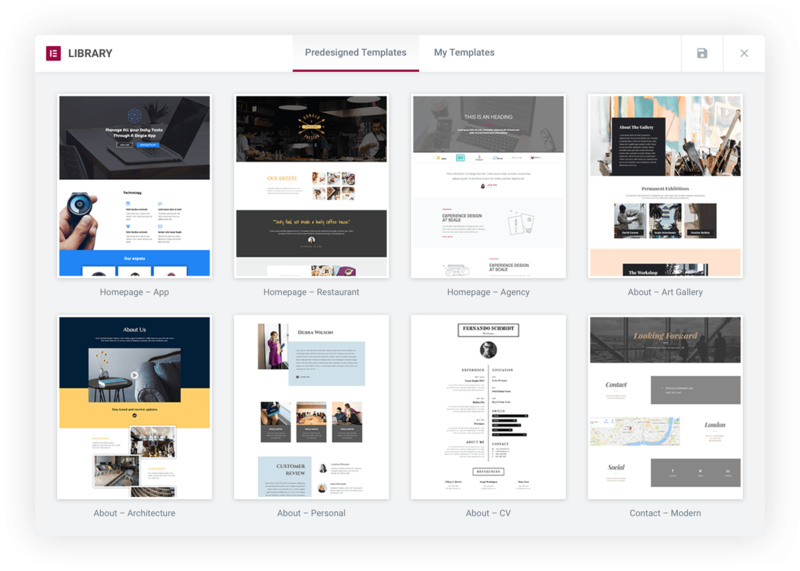 Price: $25 per month for less templates, unlimited traffic, and other platforms; $48 per month for one-click signup links or $199 per month for support for added sites and extensive training and customer service support. WP Beaver Builder was launched back in 2014 and gone through several upgrades and now the WordPress landing page builder comes with live front-end editing and WooCommerce support. Beaver Builder pricing starts from $99 and goes around $399 with unlimited site usage and access to Beaver themes. The pricing is for one year and to receive updates and support, you need to renew your subscriptions. QARDS is another landing page builder for WordPress that helps you to design great landing pages quickly and effortlessly. This setup works with a stack-and-play setup that lets you manage content and layout options with ease. Pre-designed blocks are used on QARDS to help you with creating unique content that stands out. This works with a completely responsive layout that works with any device as well. Elementor, the another landing page plugin for WordPress provides you with instant results over how your landing page will look. It all works without coding needs and helps you to establish many elements on your landing page. A call to action box, a media carousel or price table or more than 20+ elements can be added to your landing pages. These global elements make it easier for you to get most out of Elementor. Check this Elementor Vs Thrive Architect if you're looking for an comparison. Elementor also offers free landing page builder for WordPress. Price: $49 for one site and a year of support or $199 for unlimited sites and a year of support. 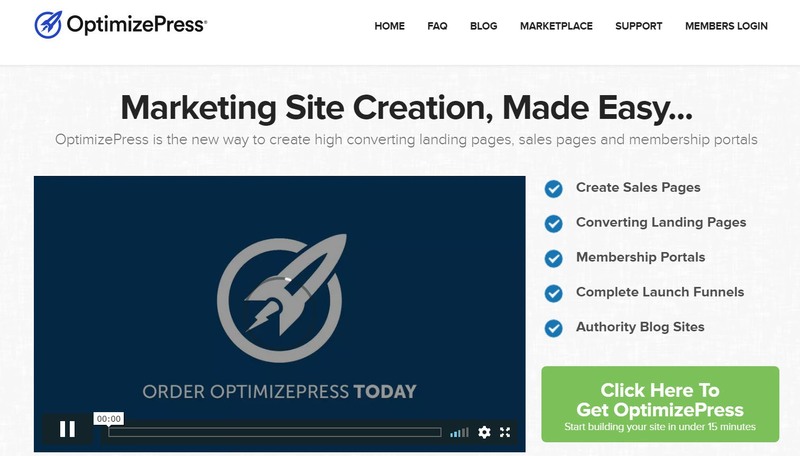 OptimizePress makes it very easy for you to product websites to your liking. You can use this to create landing pages alongside membership portals, launch funnels and blog sites among others. OptimizePress helps you to create versions of your page that work on both mobile devices and desktops. This automatically produces mobile versions although you have the option to preview any of these versions as you see fit. The next choice to find for your use is ClickFunnels. The ClickFunnels is not simply an WordPress plugin landing page builder but its more than that. ClickFunnels helps you to create a complete funnel to sell your products online. ClickFunnels lets you choose from different options for your landing page by working with many funnels. You can choose a bridge funnel for making your content more appealing or a survey funnel that helps you to get information on people who come onto your site before you move any further. The information you get through ClickFunnels will provide you with the opportunity to adjust your content and make it more useful as you see fit. After you get your content under control, you can modify your landing page based on the particular funnel layout you want to work with. The simple design of ClickFunnels provides you with a good setup for managing data as you see fit. Building page layout changes depending on the funnel you want to use for gathering leads. Offers simple customization feature for controlling the data on your site. Price: $97 per month following a 14-day free trial or $297 per month for an advanced account. The classic layout of the MotoPress program is easy to work with. This is a drag and drop program that helps you to create any theme that you want to work with. With this, you can edit your site with Google Web Fonts and even handle pages for many sites depending on the program you work with. You can use predefined layouts for any intention you hold. You can use various content elements for getting your site organized and looking as great as it can. You can use MotoPress for handling slides, images, text features, video files, audio, tabs and tables among many others. The simplified layout for MotoPress makes it easy for you to get what you want to work with organized the right way and without hassles. Supports various themes with the option to get them edited in any way. All of these programs are great to have when you’re trying to get a quality WordPress landing page to work for you. The best thing to do is to check out all of these options and to see what is available for your use. You can always go online to find demos of different programs of use. But whatever you choose, you will be impressed with what you can get out of a quality of Best WordPress landing page builders 2019. Be sure you look at what is available so you have a good idea of what you can get out of a program for any intention you hold. You will also need to look at what you are spending so you know you can get a great deal on anything you want to work with. Very informative blog. Keep sharing such useful blogs. Hey Very good information i loved it. thanks for sharing knowledgeable content.